Parks Chiropractic PC believes in the value of wellness care for you and your family and have maintained a pricing structure that allows care for all budgets. We accept auto accident, workers compensation, personal injury and most health insurance plans, including Medicare. Since there are so many plans and coverage varies widely, please stop by our office or call to provide us with your insurance information so we may do a benefits check, at no charge. We’ll call your insurance company, find out the details of your benefits and coverage and then work the cost into your treatment plan. At Parks Chiropractic PC, we're convinced that a small amount of your time and money to care for your most important asset--your health--will be far less time consuming and expensive than trying to recover it. If you feel you do not have enough time or money to take care of yourself, please contact us--we can help! Flexible payment programs can be arrange if financial hardship is the barrier to beginning or continuing care in our office. The last thing we want is for you to discontinue treatment early or avoid coming in until there is a crisis due to financial concerns. So please, we would like to encourage you to take your health very seriously. As the old saying goes, if you don't have your health, you don't have anything. Unfortunately, too many people don't discover how true that statement is until it is too late. No Insurance? Get the care you need at a cost you can afford! If you have no insurance or do not have chiropractic benefits there is still a way for you to receive the care you need. 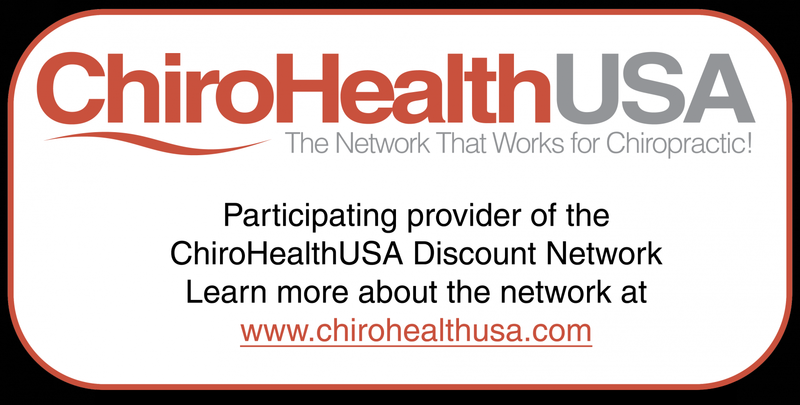 ChiroHealthUSA (CHUSA) is a contracted healthcare membership network that allows us to offer compliant discounts on our services exclusively to members. While this program is an easy choice for those with no insurance it may also be appropriate for those with high co-pays or deductibles and to save on all non-covered services. When you call to set up your appointment, ask if CHUSA is right for you! ChiroHealthUSA- How Does It Work?